Programmed Joshua Light Show into the 2013 River To River Festival for a unique collaboration with SO Percussion. The structure of the current Joshua Light Show differs little from the original of almost 45 years ago. At the time, it was Janis Joplin, The Who, Jimi Hendrix and The Grateful Dead for example, whose jams were driven by the psychedelic slipstream of so-called “liquid lights” – projections of permutating colored oils that conjured magical morphing shapes. 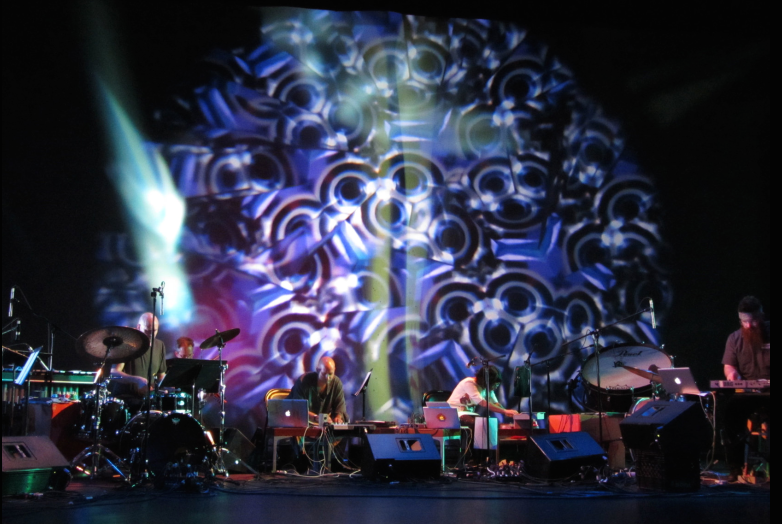 Joshua White’s appointment as light show resident at concerts in New York’s legendary Fillmore East was followed by engagements in Woodstock, Carnegie Hall and the Lincoln Center. In early 2000, the renaissance of the legendary light show finally began, launched this time in the art world. White has worked on exhibitions for the Tate Liverpool, the Centre Pompidou, the Whitney Museum, MOCA and other venues. He also began to team up with other artists, to add more complexity to the show and further develop the basic analog ideas using digital techniques. The material extravagance of the Joshua Light Show effortlessly breaks with the now common understanding of the laptop VJ as a behind-the-scenes player. The Joshua Light Show team installs a system of original devices weighing tons, which would by far tower over even the technology parks still used by electronic music’s remaining analog-synth fetishists.